High velocity winds are known to spin westwards around the planet, and to take only four days to complete a rotation. This 'super-rotation', combined with the natural recycling of hot air in the atmosphere, would induce the formation of a vortex structure over each pole. But why two vortexes? "We still know very little about the mechanisms by which the super-rotation and the polar vortexes are linked," said Håkan Svedhem, ESA’s Venus Express Project Scientist. "Also, we are still not able to explain why the global atmospheric circulation of the planet results in a double and not single vortex formation at the poles. However the mission is just at the beginning and it's doing fine; we expect this and many other long-standing mysteries to be addressed and possibly solved by Venus Express," he added. Atmospheric vortexes are very complex structures that are very difficult to model, even on Earth. Views of the southern hemisphere of Venus in visible and ultraviolet light show interesting atmospheric stripe-like structures. Spotted for the first time by Mariner 10 in the 1970s, they may be due to the presence of dust and aerosols in the atmosphere, but their true nature is still unexplained. "Venus Express has the tools to investigate these structures in detail," added Svedhem. "Studies have already begun to dig into the properties of the complex wind fields on Venus, to understand the atmospheric dynamics on local and global scales." Venus Express also made use for the first time ever from orbit of the so-called 'infrared windows' present in the atmosphere of Venus – if observed at certain wavelengths, it is possible to detect thermal radiation leaking from the deepest atmospheric layers, revealing what lies beneath the dense cloud curtain situated at about 60 kilometres altitude. 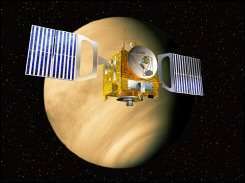 Since 7 May 2006 Venus Express has been circling the planet in its final 24-hour orbit, ranging between 66 000 and 250 kilometres from Venus - therefore at much closer distances with respect to the capture orbit. Venus Express scientists are now analysing the new data coming in, which already show what seems to be exciting new features. “We have never seen Venus in such great detail so far. We are eagerly waiting for these new data to be available,” concluded Svedhem.